Crantock is a small village on the North Cornwall Coast, near Newquay, and is a popular destination with holiday makers coming to Cornwall, particularly Surfers. Crantock is only a few minutes drive to Newquay, one of Cornwalls most popular resorts, and is also close to many of Cornwalls best attractions. Crantock has two Pubs, a handful of shops including coffee shops and arts and crafts shops, and a small range of accommodations from bed and breakfasts to self catering cottages. The local memorial hall is used for a range of local events, and was built to commemorate those who fought and died in World War II. The majority of the parish is now owned by the National Trust and has become well known for its varierty of rare plants and wild flowers, particulaly along West Pentire Head which has been flagged as a site of special scientific interest. 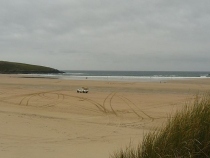 The Crantock Bay Hotel has a webcam overlooking the bay, the webcam which, has been in operation since 2005. 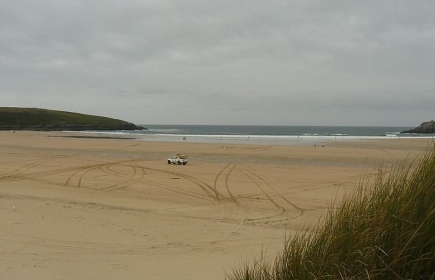 The beaches at Crantock are vast, and are a site to see on any day, regardless of the weather. Crantock is, one of the few places left in Cornwall that hasnt seen an impact by torism and is a charming place to visit. Crantock is a great place to visit to get away from the crowds, yet is still only a short drive away from the busy surf town of Newquay. Crantock Webcam.